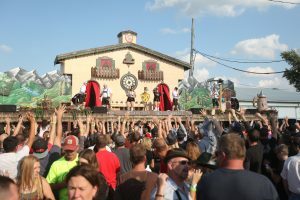 A much beloved fixture at the Oktoberfest, The Cleveland Glockenspiel—measuring in at 55′ in length—is the largest of its kind in the United States. Oh, and if you’re having trouble getting unstuck from that status quo, don’t forget to try some of the tri-colored flag shots sold beneath the glockenspiel. Trust us, they’ll help you get your groove on… though we can’t promise you’ll be able to get it off, so drink responsibly.